People in Manipur have continued to stage various forms of democratic protest against the Citizenship (Amendment) Bill for the last few days. 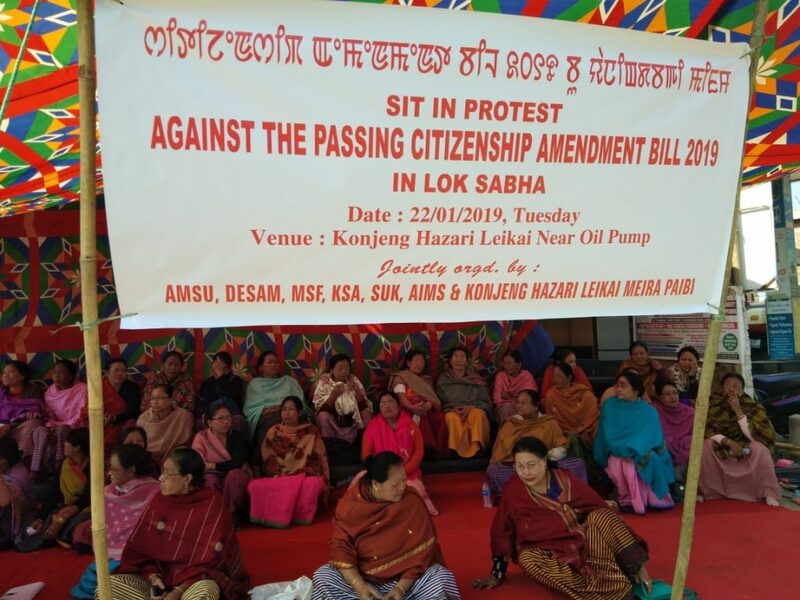 Displaying anti- Citizenship (Amendment) Bill festoons, women folks of various localities staged sit-in demonstration at the areas of Sayang, Konjeng hajari leikai and Keishampat, Waithou – all in Manipur’s Imphal West District on Tuesday. On Monday, a Manipur Pradesh Congress Committee team led by its president, TN Haokip and comprising Congress Legislature Party leader, O Ibobi Singh and Congress Working Committee member Gaikhangam called on Governor Dr Najma Heptulla at the Raj Bhavan in Imphal and urged to convene a special session of the Manipur Assembly for a debate on the Citizenship (Amendment) Bill. It may be mentioned that a public convention held under the aegis of six students’ bodies -All Manipur Students’ Union, Manipuri Students’ Federation, Democratic Students’ Alliance of Manipur, Kangleipak Students’ Association, Students’ Union of Kangleipak and Apunba Ireipakki Maheiroi Sinpanglup at Manipur University hall on Sunday resolved to demand immediate withdrawal of the Citizenship (Amendment) Bill 2016. It decided to appeal to the Rajya Sabha MPs from all over the country and the Northeast in particular to oppose the Bill and resolved to demands for a special Manipur assembly session on or before January 30 to oppose the Bill. However, Chief Minister N Biren Singh addressing an event in Imphal on Sunday afternoon reiterated that there was no change in State Government’s stand in pressing the Centre to give assent to Manipur People (MP) Bill, 2018 before the Citizenship (Amendment) Bill becomes an Act. MP Bill was passed by Manipur assembly on July 23, 2018, seeks to regulate the entry and exit of non-Manipuris to and from the state.